Of all the simple pleasures in life a homemade dinner is one of them. One of my favorite family dinner meals is salisbury steak, mashed potato and corn. Yes, I could enjoy this meal with any kind of corn but my favorite and most simple is canned. I am a child of the 70’s and convenience foods were all the rage. 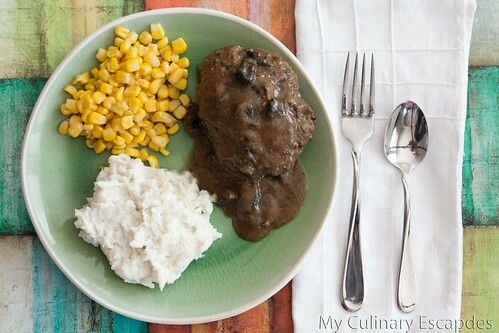 While I may not have had many dinners in front of the television set on tv trays when I had the chance to pick a tv dinner the salisbury steak with potato and corn was my favorite. Mashed potatoes on their own are so homey. Creamy and delicious. Warm and fluffy. Mashed potatoes make everything better. 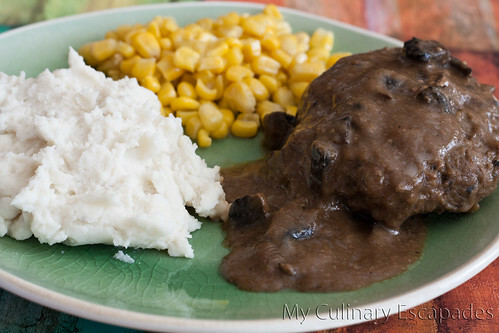 The salisbury steak are meaty and tender covered in a delicious gravy. 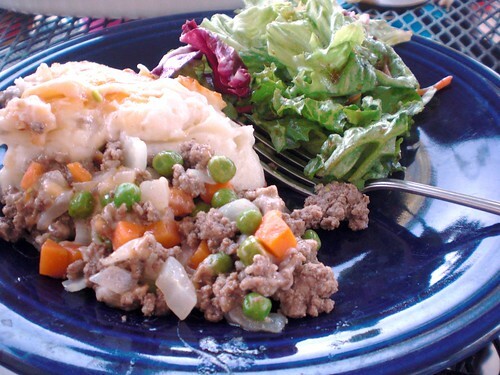 Place the ground beef in a large mixing bowl. Dice your onion and add to the bowl. I prefer to use a food chopper, it makes quick work of the onion. Dice up 1/4 of your mushrooms in the same way and add to the bowl. Add 3 dashes of worcestershire sauce, 1 egg and 1/4 cup breadcrumbs. Mix well with your hands to incorporate all ingredients. Divide mixture into equal parts for how many people you are serving. Form mixture into oblong patties about 1 inch thick and place in bottom of a 13X9 pan. Slice the remaining mushrooms and place in pan over the patties. Mix dry brown gravy package with water as the directions on the package indicate. Do not heat as the directions indicate, simply pour the mixture over the patties. Place pan in oven and bake for 30 minutes. Every 10 minutes use a turkey baster and baste the salisbury steaks with the gravy. 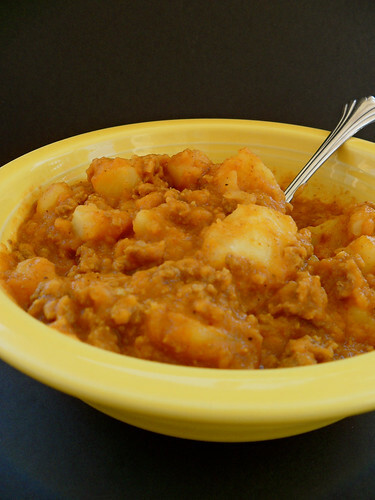 This recipe can easily be doubled, in fact with a family of 6 I never make a single batch. To double increase all ingredients except the egg. I was once watching Alton Brown make meatloaf and he said that no matter how much meat you use you never use more than one egg. Sounded good enough to me so I follow that rule.